The Maiden, Mother and Crone represent three aspects of feminine Archetypal energy symbolized by the waxing, full and waning moon. Each of these lunar archetypal energy types further corresponds to a particular phase in a woman’s life,in the traditional time bound, linear view of time. The Maiden years would be our early years, childhood , young adulthood, the years before you choose your path and all is pure potential. 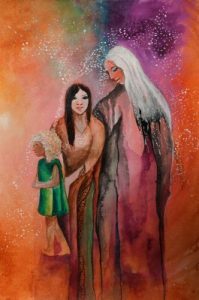 The Mother years are years of creation and fertility, when you mother a child or a creative project, your focus is on manifestation and blossoming. The Crone years are the later years of reflection, application of lessons learned and embodiment of leadership. The Crone is wise and can also been seen as the earthly embodiment of the higher self. Working with these energies is an exercise in acceptance of the non-linear, metaphysical notion of simultaneous time. When we embrace the idea that everything is happening now, then we see how we simultaneously fulfill these roles and live in these archetypal energies. We see that our lives are about connection, continuity and convergence. We hold hands with the various versions of ourselves, linked by our values and our decisions in the now. It is the values that we live by and the decisions that we make which will determine the quality of the energy we inhabit , the experiences we create and the perspective we have on the movement of time. New Moon- This is when the moon is not visible, it indicates the darkness of pure potentiality and is the best time to renew your life. Waxing Crescent moon- There is just enough light from this moon to give you a glimpse of what’s to come. Start working on the ideas that came up during the renewal phase. First quarter moon- Persist. The fruits of your labor are not yet visible but commitment is key in this phase. Waxing gibbous moon- Tweak and perfect what you have been working on. You’re almost there! Full Moon/Mother phase- Celebrate! The results of your hard work should be visible now. Your energy is also at its peak. Waning Gibbous Moon- Assess and reflect on the fruit of your labor. Give thanks. Last quarter Moon- Declutter and release. This is a good time to say goodbye to anything that isn’t working for you. Waning crescent moon- Relax and recharge. Your energy is lower now so use this time to treat yourself. New Moon- Once again reboot, start afresh integrating the knowledge gained in the previous cycle. Use the moon phases and the Mother, Maiden,Crone archetypal energies to renew and reinvigorate your life, to heal the past and to transform.